We made it to WV safe & sound and are having a great time. 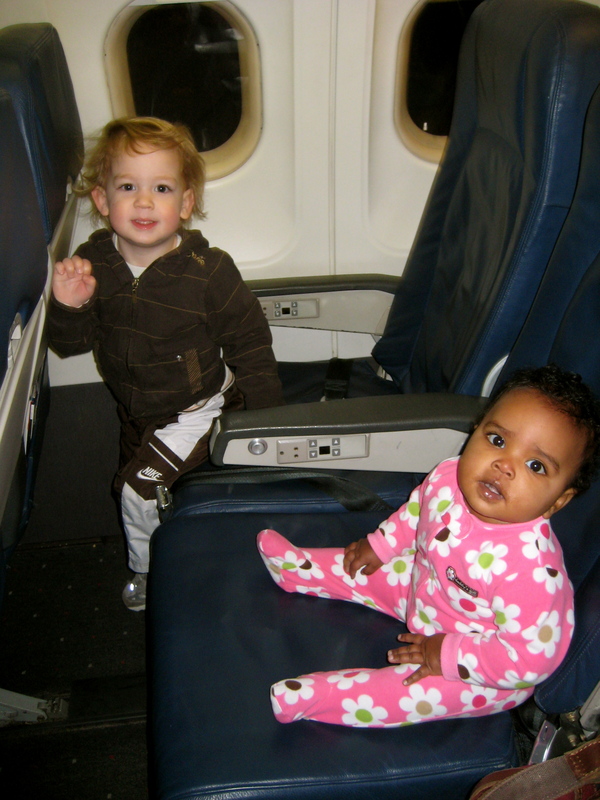 But, I’m not gonna lie, the plane ride with two kiddo’s by myself was…um…STRESSFUL! Just keeping it real folks. The morning started at 3:30am as we drove to the airport for our early morning flight. That right there should have been a red flag that the day was going to be a rough one! Once we settled in on the flight, I could feel the glaring eyes of judging passengers burning in my back as I bribed Nash with lollipops, food, and anything else I could pull out of my Mary Poppins carry on bag to keep him happy and quiet for the duration of the flight (and not very successfully I might add.). He was obsessed with the widow blind…open, close, open, close,open, close, open, close,open, close, open, close,open, close, open, close,open, close, open, close,open, close, open, close. I think you get the picture. Meanwhile, I was banging my head on the seat in front of me and counting down the seconds until we landed (**okay, not literally, just written for effect so you feel my pain!). Poor Nash was just so excited to be flying he couldn’t keep his energy contained…I just feel bad for the guy sitting in front of us receiving all that energy in the back of this chair. Ay yi yi! Needless to say, I was ecstatic to finally land and be greeted by my sister and her two precious kids waiting for us a baggage claim. From now on I think I am going to take John Denver’s advice and let Country Roads Take Me Home instead of the not-so-friendly skies. Now that I have calmed down from my stressful voyage, everything has been going great and Evyn is LOVING all the attention and accolades of her new family. 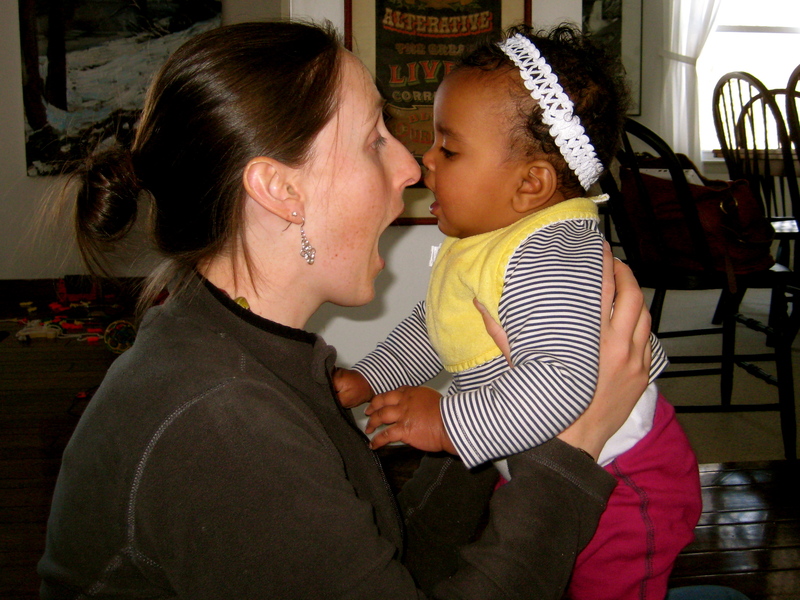 Everyone is just so happy to meet her and cover her in kisses! We have even let a few people hold her for the first time! Up until now, only Bryson and I have held her as a way to enhance our bonding with her. We are taking it slow (not ready to leave her with a sitter or anything yet! 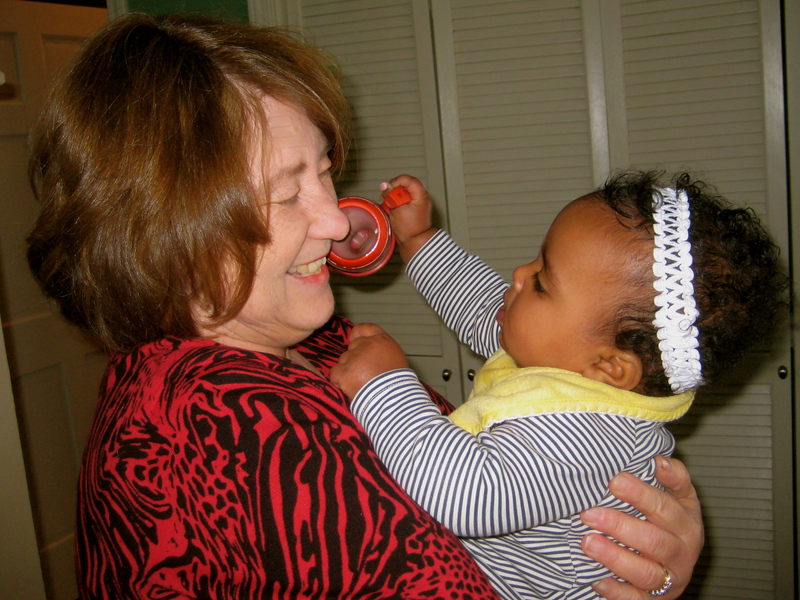 ), but it sure is fun to have other people get hold and love on our bundle of joy! water break at the airport. 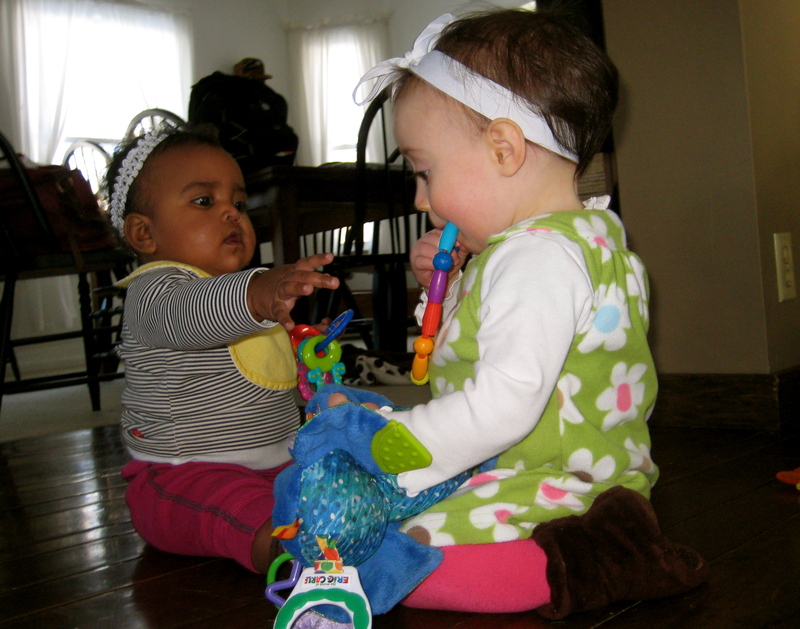 Evyn + Charis playing and talking about the latest hair bow styles. 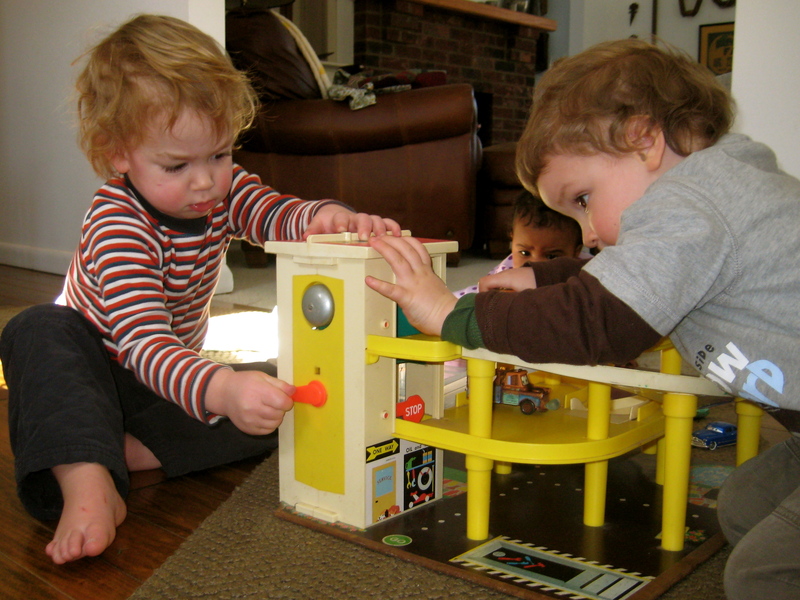 Nash + Xavier playing with a vintage toy...aka, my toy growing up! 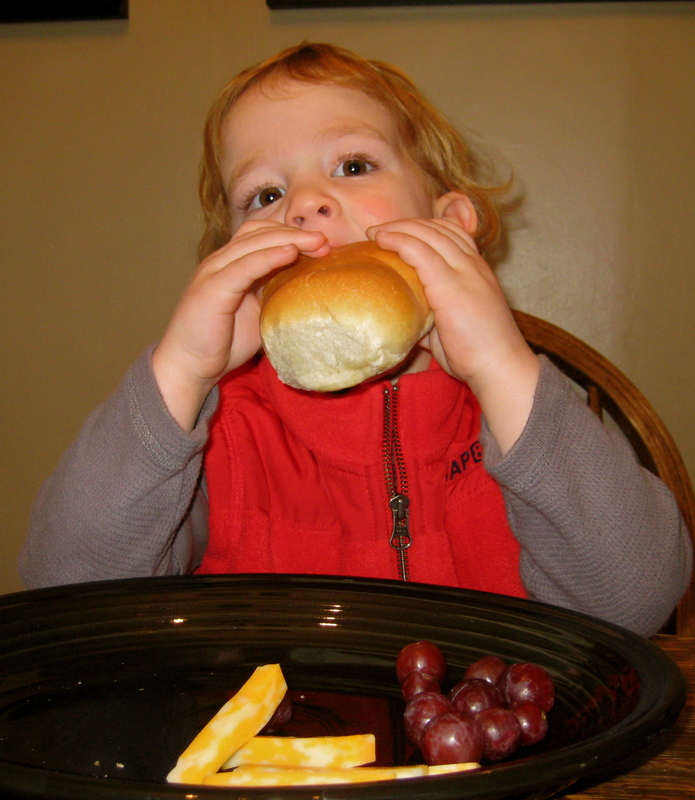 Nash's first Tomaro's Pepperoni Roll, a Clarksburg, WV classic! hope you guys are having fun! we miss seeing you guys! the water break picture is hilarious. 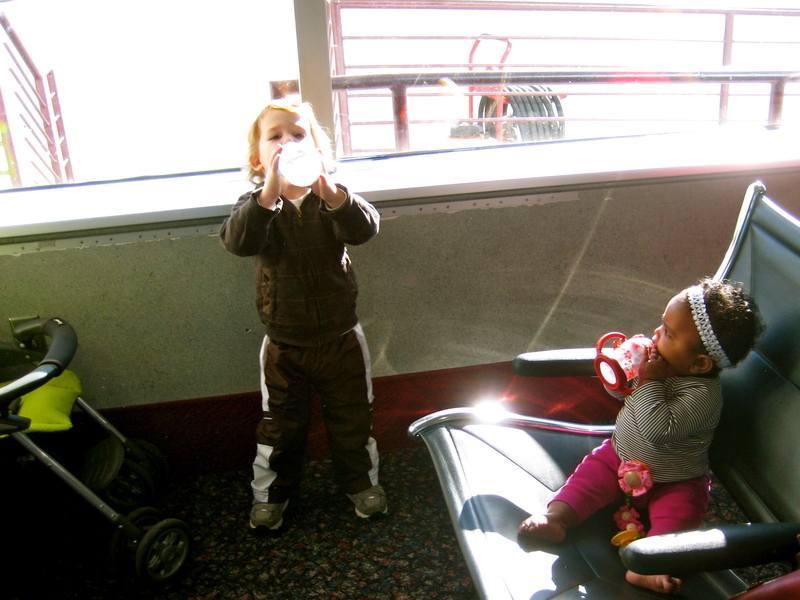 airports are quite the work out…especially when you have to travel in a stroller! A plane ride with two young children…you really ARE a superhero. Seriously. That wears me out just thinking about it.